Two things coincided to make me tackle a simplified version of this Italian classic – it featured on the brilliant Jamie’s Comfort Food and a box of lovely SO Organic goodies arrived from Sainsbury’s for me to try including arborio rice, Pinot Grigio and Balsamic vinegar. So I was all set for a saffron risotto to go with it and figured they’d both be good dishes to bring out the best from the ingredients. While I’ve thoroughly enjoyed the Jamie series – the fried cheese sandwich was the best thing I’ve seen on TV all year – it’s not an easy thing to just pop out and pick up veal shin. I have found a local online supplier which I’ll try soon, but in the meantime, I headed to the butcher. No veal obviously, and no beef shin on the bone either. He cleverly suggested another cut suited to slow cooking and offered me some beef rib bones that had come off some steaks he’d just cut. The bones are there for depth of flavour, but it’s pretty good without if it’s really slowly cooked and the flavours are built up in the pan. In keeping with the Organic theme, I managed to source all the ingredients either from the Roath Farmers Market or from the SO Organic Sainsbury’s range. Start on the Osso Buco about three hours before you want to eat – or use a slow cooker and go out for the day instead (I went sloe picking – gin recipes to follow…). Flour and season the beef well then fry in batches in a heavy casserole – get it good and brown all over. Brown the bones too. Remove, then in the same pan fry diced onion, celery and carrot until soft. Put the beef (and bone) back into the pan and add a good glass of white wine – the Pinot in my case. Let this reduce to almost nothing and add a couple of chopped tomatoes and some tomato puree. Top up with chicken stock so that the meat is fully covered and pop on a lid. Cook in the oven at about 150 for at least two hours or in a low slow cooker for 4. One the meat is meltingly tender, remove and keep warm. Skim off any fat from the sauce – it’ll need a bit of thickening up now so probably about half an hour simmering on the hob. Once it’s lovely and thick, pop the beef back in to warm through. While that’s doing, make the risotto. Finely dice an onion and fry it in butter and olive oil. Put a separate pan of chicken stock – about a litre – on to simmer. Soak a good pinch of saffron in a few tablespoons of warm stock. Once the onion is translucent, add the rice and stir while it fries for a minute or two. Add another glass of the Pinot and let it be absorbed into the rice while stirring all the time. Now add the stock, a ladle at a time until it too is absorbed each time. After about four ladle’s worth, add the saffron/stock. Keep adding the stock until the rice is just cooked. Take off the heat and stir in a good handful of grated parmesan and a large knob of butter. Put a lid on and leave it for a few minutes so that the rice, cheese and butter come together into a thick, creamy sauce. 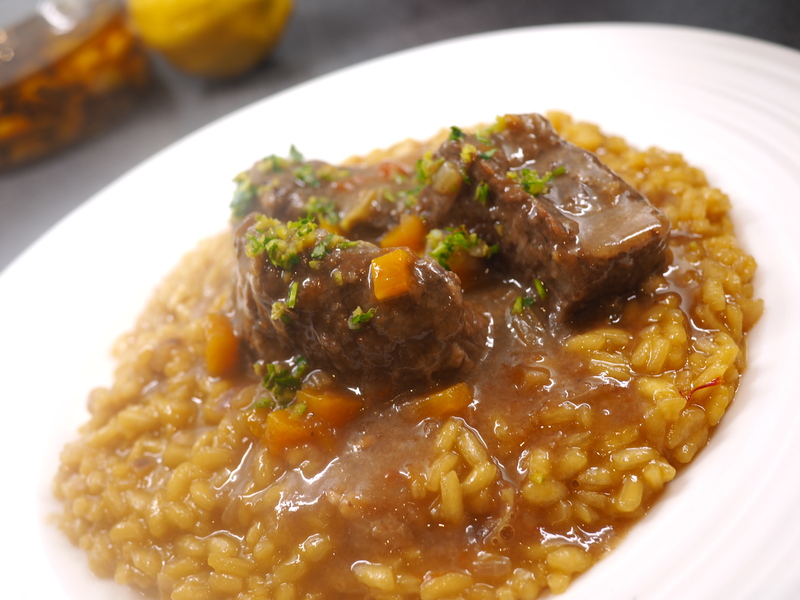 Serve the beef on top of the risotto and spoon over the sauce. Top with gremolata – chop roughly equal parts of lemon zest, garlic and parsley together. Or just grate over some lemon zest – it just needs a little something to cut through the richness of sauce and risotto combined. It makes the whole thing surprisingly light. Yes, it’s two meals in one, but there’s nothing technically complex, it just takes time. The good news is you can make the osso buco on the weekend then warm it through and make a quick risotto in the week. It’s a pretty amazing Monday night tea! In celebration of Organic September, it seemed like a good way to get the most flavour out of some great risotto rice, white wine, butter, cheese and vegetables.